As a gardener, there are many bugs and beasties that we try to keep off our plants and out of our gardens. But when it comes to earthworms; the more the merrier! An abundance of worms is a sure sign that you have healthy soil. How do earthworms help our garden? Earthworms carry out two critical jobs for you. Firstly, earthworms are often referred to as nature’s plow. As the worms move through our soil they create tunnels. These tunnels transport air and water to roots and seeds buried underground. Without access to air and water, plants can’t grow well. Earthworms do exactly the same job as plowing your soil; just without the back ache! Secondly, earthworms convert the organic matter in your soil into worm ‘castings’…. a polite name for worm poo. This worm poo is rich in phosphorus, calcium, nitrogen, and magnesium. These are all important nutrients for strong plants and a healthy garden. So, if your plants and garden are struggling and looking tired, take a look at your soil. Likelihood is, there will be few earthworms in it. Adding fertilizers to poor soil is only a short-term fix. If you want to grow a healthy garden you need to start by increasing your worm population. If you want more worms in your garden, why not simply buy some? Unfortunately, worms have a habit of moving (and dying). If they don’t like your garden soil, they’ll simply move on. If getting healthy soil was as simple as adding worms, then there would be a thriving worm-selling industry….. there isn’t! Give them more food! Worms love organic matter. Add organic matter to your soil and the worms will come. Food waste is the most nutrient-rich form of organic matter. 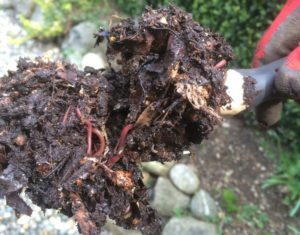 By adding food waste to your soil you should see results and increases in the number of worms within weeks. 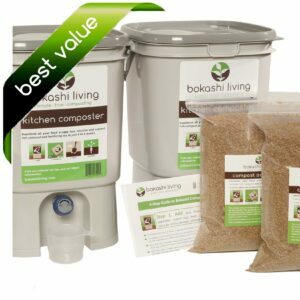 By bokashi composting your food waste you eliminate potential pest issues and speed up the decomposition process. Go organic. Worms are very sensitive to physical and chemical changes in your soil. Chemical fertilizers produce salty conditions in your soil and your worms will soon leave. Avoid adding any chemicals to your soil. Keep them warm. Worms can survive in below freezing temperatures. However, they may not be able to tolerate sudden freezing. Protect your earthworms with mulch or a cover crop in the cold months. These act as blankets to keep the soil warm and a source of food for your earthworms. Can you double your worm population by cutting each one in half? Sadly, no. The myth that if you chop an earthworm in half you get two worms is false. The tail half of the earthworm (without any organs) will die. The head half of the worm may regrow a (shorter) tail and survive. Some species of earthworm are thought to be ‘better’ at re-growing their tails than others but please don’t head out into your garden to try this…. that would just be cruel!